His biographer, David Daniell, claims that Frith made a translation into English from Latin of Divers Fruitful Gatherings of Scripture, a collection of passages from scripture known to most English speaking reformed Christians as Patrick's Places and widely influential as a radical exposition of justification by faith in English. This was published in July 1529. (6) This was exported into England and leading conservatives such as Bishop John Fisher and Stephen Gardiner, called for his arrest. 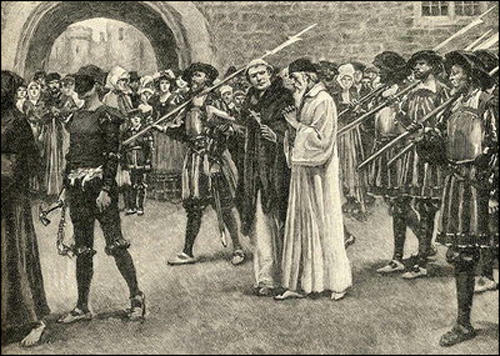 John Frith being led to his death. Among all evils of the persecution, none seemed worse to us than the cruel treatment and death of John Frith, a young man who stood far above his companions in knowledge and godliness. Even though his brilliance could have brought him honor and dignity in the secular world, Frith chose to dedicate himself to the church, believing that the truly good man should live for others, not for himself. After studying at Cambridge and becoming a very well-educated man, Frith became acquainted with William Tyndale, who planted the seed of the gospel and sincere godliness in his heart. At that time Thomas Wolsey, cardinal of York, built a college in Oxford named Frideswide, now known as Christ's Church - not so much because of his love of learning but to leave himself a perpetual monument. He gathered together the best vestments, vessels, and ornaments in the land and gave them to the college, also appointing the best professors he could find, one of whom was John Frith. When these professors conferred together about the abuses of the church, they were all accused of heresy and thrown in prison. Frith was eventually released on the condition that he stay within ten miles of Oxford, a condition he immediately violated by going abroad for two years. He secretly returned to visit the prior of Reading and was arrested there as a vagabond. Frith was an honest man who found it very difficult to lie convincingly, so the authorities were fairly sure he wasn't a tramp, despite his disguise, but they failed to make him reveal his identity. Until he could be identified, he was locked in the stocks at Reading without food. When he began to suffer badly from hunger, he asked that the local schoolmaster be brought to him. As soon as Leonard Cox arrived, Frith began to complain of his captivity in Latin. They talked of many things in both Latin and Greek, then Cox hurried to the town judges and complained of the treatment being given such an excellent, well-educated young man. Frith was freed from the stocks without further punishment. But he had no time to enjoy his freedom because Sir Thomas.More, then the chancellor of England, was looking for him all over the country and offering rewards for his capture. Even though he moved from place to place and disguised himself, Frith was eventually captured and imprisoned in the Tower of London. While there, he and More wrote back and forth to each other, arguing about the sacrament of communion and purgatory. Frith's letters were always moderate, calm, and learned. Where he was not forced to argue, he tended to give in for the sake of peace. Eventually Frith was taken before the archbishop before the bishop of Winchester, to plead his case. Last of all, he appeared before the assembled bishops in London. His examinations revolved around two points: purgatory and the substance of the sacrament. As Frith wrote to his friends, "I cannot agree with the divines and other head prelates that it is an article of faith that we must believe-under pain of damnation-that the bread and wine are changed into the body and blood of our Savior Jesus Christ while their form and shape stay the same. Even if this were true, it should not be an article of faith." 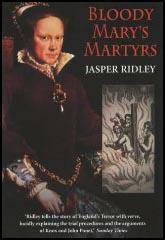 On June 20, 1533, John Frith was brought before the bishops of London, Winchester, and Lincoln and condemned to death. On July 4, he was led to the stake, where he willingly embraced the wood and fire, giving a perfect testimony with his own life. The wind blew the fire away from him, toward Andrew Hewet, who was burning with him, so Frith's death took longer than usual, but he seemed to be happy for his companion and not to care about his own prolonged suffering.